After Wendy wrote about how she learned to knit and included in her post a few inspirations, we got a few e-mails asking for the animal scarf patterns. They do look very cute and I thought my younger boys would like a cat and a dog scarf, so I sat down to knit one and write the pattern as I went. If you are adventurous and are a serious DIY-er, you can make your own pattern. It is easy and the pattern I wrote can be easily changed/altered to your own taste. I used worsted weight yarn on size #8 straight needles. Now that you know how, cast on 28 stitches using Provisional Cast On . Or less. Or more. Depending on how wide you want the scarf to be. According to the website where they sell those animal scarves at, it is 4 inches wide and 36 inches long. Mine is 4 3/4 inches wide. Knit up a swatch to check your gauge and measure how many stitches you have in 1 inch. Then just multiply that number by the number of inches you want the width of scarf to be. Simple. This way you can use any yarn you want! Note: now that I knitted up the scarf I think I may like the skinnier better. I am already working on a dog version and I changed the width to 4 inches. Next step: knit each row. You can make it stripey or just one color. It is up to you. 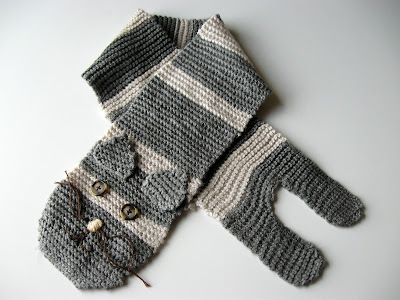 Knit every row and make sure your toddler does not get a hold of your knitting and pulls it off the needles, wrapping the yarn around furniture as he runs through the whole house. Twice in a week. Keep knitting to the length you want the scarf to be. Let's move onto the legs. Knit 10 (or more or less, again, it is up to how thick or thin you want those legs to be) then bind off 8, and Knit the last 10. Now turn your head towards your right shoulders to look at the next picture, because I forgot to flip it. Put your first 10 stitches on another needle, safety pin, chop sticks...something. Note: you will knit from the side where the working yarn is. Knit all rows, as long as you want the legs to be. Mine are 4 inches long. To finish, K2TOG, K6, K2TOG, and the next row: K2TOG, K4, K2TOG, last row: bind off. Insert needles back in the way it was, then turn your work and start knitting. Repeat process with other leg. Legs are done, now let's get back to the Provisional Cast On and insert needle. Just to show you how it looks...those little X's are 2 stitches each. 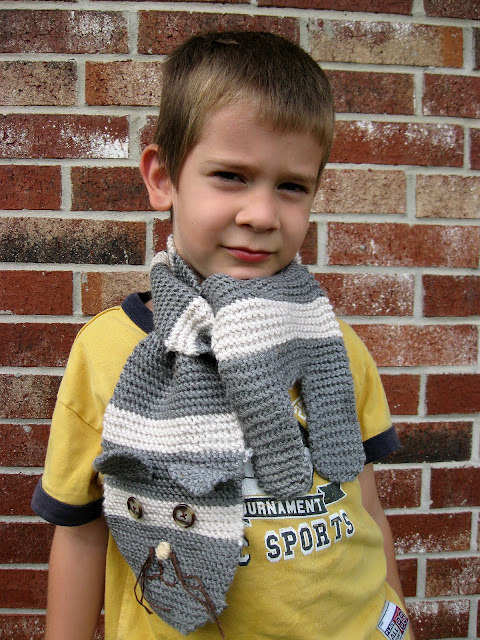 Here is your chance to make the scarf a little longer if you want, otherwise Knit 2 rows. Now, for the decrease. K2TOG, knit to the last 2 stitches, K2TOG. Repeat until you have half the stitches left on your needle (14), then bind off. Now you get to weave in all those loose ends...Note: Don't forget to remove the extra yarn used for the Provisional Cast On. Using yarn and yarn needle, I added a nose and other features. I used embroidery floss for the whiskers, added button eyes, sewed on the ears and then I steamed it with my iron. This is important, because it will help set the shape and the legs will not curl up. Enjoy! Spotted Dog Scarf is coming next week, so come back and check it out.